Straightener Rolls are utilized in a variety of applications with wire and tubing. These sets of tooling are often referred to as guide rolls, flatwire straightening rolls, cable straightening rolls, tube or wire straighteners. 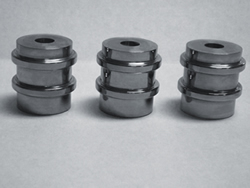 Reliability and precision are the most critical aspects of these sets of tooling and carbide is up for the challenge. Our precision grinding and machining shop produces these rolls at the highest level of quality. When it comes to achieving longevity in tooling life, connect with us.